Maybe more than one has heard about Warhammer 40K, and his huge and growing universe, with a lot a races, stories and dystopian undertone, well in this game we have four factions trying to dominate a sector of the universe. I don’t play Warhammer 4000 (minis) but I had read a lot and I love the stories. first think when you see the game is the huge box and inside a lot of minis high detailed, four kind of it (Space Marine, Chaos Marine, Orks, Eldars), and structures (citadel, fortress, and factory), Also have card for each faction, dices and titles to the map. The game have many rules to explain in a simple review, but a going to talk about the mechanics, basically put orders and dominate terrain to obtain a kind of token (who has four is the winner), at this point is quite similar to Game of Thrones. Each faction have their cards and style to play, very different one to other. Combat, resolve first with dice; depending the forces of your troops and later with card adding strong, defense or moral to the value of your dice. Is a game with much potential to become the best game of WH40K, representing the spirit of each faction property, if you love WH40K almost must play it. About the factions, Eldars, feel like a little weak I hope with a expansion could be better and add more like Tau. 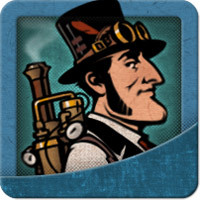 First I must say I love steampunk themes and this is a great game with this thematic. We have to choice a famous inventor among Albert Einstein to Nicola Tesla and you’re ready to start a race to define who is the best inventor. Vent: that is the most difficult to understand and the begging because in the first round don’t have vent. So I will explain with the race phase. Race: You’ll roll every dice gained in the draft to active Machine part of your invention. And every dice you use it’ll remain in your machine, and you can’t use it, for that is the vent phase (in the next round) you use the cogs to reduce the dice value and remove the dices, a cog reduce in two. Damage: the race track isn’t smooth, there are terrain with obstacles that will damage your machine for every negative point you must destroy a part. Well I really love this game, all the parts made a beautiful game as much as components as funny experience game. And now I waiting for an expansion. I recommend play with 3 or 4, maybe 5, more of that take more time and you’ll lack of dices. Edit: I must add after play the table is a mess with three kind of dices, red, blue, yellow and four kind of card and cogs for everywhere, put all into the box, take a litle time. Who played Age of Empire III on PC? I wanna begging with that question: Who played Age of Empire III on PC? I did this question because if you want a board game similar to computer game, you’ll be disappointed. Well AoE is a eurogame with worker placement and area control to do points. In the game we are a civilization and with the discovery of a new continent (America) we try to conquest it, for that we have 5 colonist each turn to do actions different among gain a recourse, conquest (go to the a unoccupied place), explore (go to a discovered place), buy a research (quite important in late game), gain a new worker and finally battle or war. Soldiers: use to battle, kill other units. No Thanks! Is a great party game with a couple simple rules, easy to play and you get a good time to enjoy with friends and family. The player with the lower score win, the number in the card is its value and any chips is a -1 point. A player has to choose one of two options, he or she take a card and put it in front, and the other action is he or she say “no thanks” and put a chip on the card and pass the turn. Before start each player an equal number of chips, generally 11, 9 to six players and 7 to seven players). Shuffle the deck and put 9 card aside to the round, you are ready to start. This is the perfect game to play with people that never played a board game before, for that is a party game with flexibility I play this with 9 people and really enjoy. Also is a family game, if you game nephews or little cousins, children, you can play with them and enjoy as well. And practice maths also you to, in our days we need a calculator or cellphone to made math addition. Five minutes to learn the game and you are ready to play between above 5 to 20 minutes. Number of player 2 – 4 best played with 3 or 4. It came with few components, 45 wooden cubes, 15 per each resources, you will feel the lack of cubes when you play 3 players game and with 4 players this will be awful. Another thing is the replayed, I played about five time and I think the game is predictable depending what the others played in first round. In conclusion about pros and con: this is a really good filler game, perfect to begin the evening and/or between big wargames. The special actions cards are quite powerful and useful, try to get the more possible in the esplanade (middle of the board), especially the card to still artefact to another player. Actually I discussed this with my friends, someones don’t like it, I think is better hide the cards to hide you score and no one spoiled it. After many discussion we decide to hide cards but not the last one. To avoid attacks to a strategyc planet, I build (or move) one ship to space next to the planet, with that the enemy had to made almost two moves. to teach to new players or when we want a fast game, I made the setup of the track with two tiles less, with this the track is small (not to much) and the match have a duration of 30 or 40 minutes, pretty useful to beginners undestand the mechanic and interactions of the game. Is very important gain more workers with an upgrade in the first 3 rounds, with that you will do more thinks.